At In Depth Events, we are THE live event video production experts you need for your live event. The first thing our event specialists will help you determine is which of our services you need. Are you planning on having live camera IMAG? Or video roll playback on a series of screens at your live event? Do you just need to record archival video footage of your live event? Do you need to provide the video work in real time to attendees offsite using video streaming? Is your event going to be held in an indoor or outdoor environment? Taking Live Event Video at the Show! Our live event video production services have been used in a variety of special and live events. Live event production for corporate meetings is certainly at the top of the list – we’ve provided video equipment rentals for live corporate events, panel discussions, and corporate meetings for years. 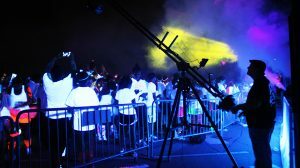 Large concerts, fashion shows, and festivals have used our live event video production services for live IMAG during their event, in both indoor and outdoor environments. Our professional video technicians have also worked with marketing firms to provide video equipment rentals that are a little out of the ordinary. We’ve provided experiential marketing events a web streaming service so users could watch the event in real time. We recently provided our live video equipment rental services for an experiential panel discussion that used IMAG on a large format LED Video Wall. Our event specialists are creative people that will work with you to make your event a fun, safe, exciting, and memorable experience for you and your attendees! Ask Us a Question of In Depth Events today for your live event video production needs and requirements. Our event specialists and video experts are excited and willing to use our experience to create the perfect event experience for you and your attendees. We look forward to hearing from you and working with you!